The Americans with Disabilities Act (ADA) was put into place to ensure that persons of varying abilities have equal opportunities. In 1990, the ADA required business owners to place both indoor and outdoor ADA approved signs at their establishments. The act helps people with a disability be able to enjoy your business. Having ADA signs not only helps your business to stay in compliance, but it also ensures the safety of your patrons. As a business owner, I am sure you are busy with the day-to-day operation of your company. Let us help you take one thing off your plate by providing a brief overview of ADA sign requirements. All business establishments must have tactile braille signs displayed at the entrance of their bathrooms. 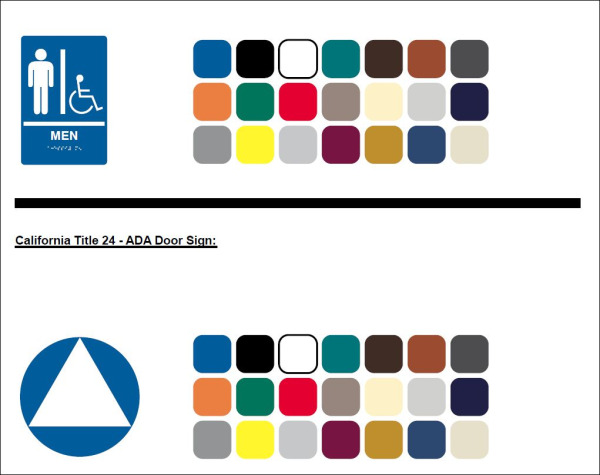 The ADA has established very specific guidelines that must be followed when making a restroom handicap sign. 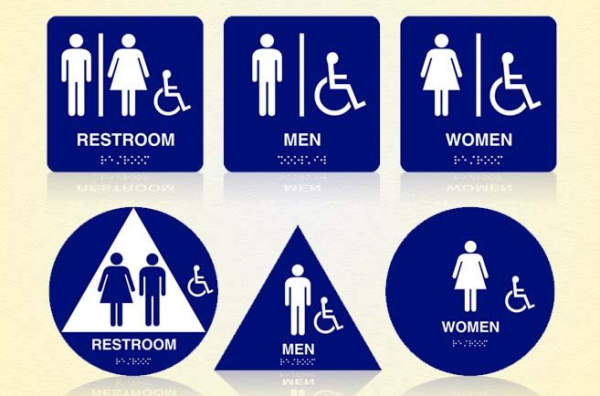 The types of signs available include male, female or family bathroom signs. The dimensions that need to be used are dependent on the type of sign that you choose to use. The signs are made of acrylic with a tactile braille top layer. The signs must include a picture, written words and the words in braille. The braille must be a specific height. In addition to having ADA approved signs for your patrons indoors, you must also have handicap parking spaces available. The Americans with Disabilities Act has strict guidelines as to where handicap parking spots can be located. Below are the requirements for outdoor parking ADA signs. The sign color must be blue and reflective. The International sign of Accessibility must be white. The sign should be no smaller than 70 square inches. The bottom of the sign should be exactly 80 inches from the ground. The sign should display the fine for parking in the spot illegally. Parking lot should have another sign stating that unauthorized vehicles will be towed. 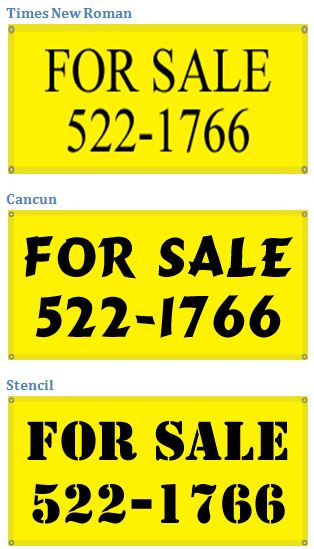 It is imperative that you also look up the requirements on how and where to place the signs after you purchase them. Different types of parking spaces require a different placement of the ADA sign. As you can see, there are many requirements you must take into consideration when placing ADA signs in your business. When looking for ADA signs, it is best to ensure that you are getting signs that are high in quality. Many businesses that design signs are very well versed in the Americans with Disabilities Act requirements. Don’t risk being non-compliant. Be sure to choose a reputable sign business for your ADA signs. If you need further information or have any questions, please e-mail us at thesignstudio@sbcglobal.net or give us a call at (818) 843-9200. The Americans with disabilities act protects individuals with a disability,who are qualified, from being discriminated against. A qualified individual with a disability is able to perform tasks in a work environment with or without accommodations. Reasonable accommodations made for an employee with a disability includes making a place of business accessible for the person to use. This also involves making certain adjustments to the schedule. Modifications to equipment, devices and examinations are included. Policies, trainings and interpreters are also part of the modifications. Modifications in a facility includes proper sign usage for a person with a disability. There are certain requirements that ADA signs must meet. Some of these requirements include typography, tactile typography, locations, and mounting heights. When it comes to the typography on the signs, ADA requires that an acceptable font to be used on all upper case and the font should be raised at least at 1/32". The tactile characters must be san serif. You are not able to make the font italic, oblique, or over decorate it. It is important that the character proportion of the width of the "I" be at 15 percent of the letter height. The width of the "O" should be anywhere from 55 and 110 percent of the height of the upper case "I". You may also want to know that the copy height of the tactile information be at a limit of 5/8 inch and 2 inch. Also the tactile spacing be at a minimum of 1/8 inch and the maximum amount allowed is four times the stroke width. Spacing between the lines of copy have to be at a minimum of 135 percent and the maximum is at 170 percent of the "I". Braille should be placed underneath the characters. The shape of the braille must be rounded. The grade 2 braille must meet dimension and capitalization ADA standard requirements for accessible design. Some of the tactile typography fonts allowed are Arial, BAV Garde_Normal, Frutiger_Normal, Futura Book, Heletica Neue_Roman, and Myraid Pro(MP). The permanent locations of ID signs should be located at the doorways. Only if there is no room can a sign be placed at the nearest adjacent wall. Signs on double doors have a couple of ways that it can be mounted. One way is that the sign be placed on the door that is not being used. If both doors are being used then the sign should be placed on the right to the door at the right. If the right hand side is occupied with other items, then the nearest adjacent wall will do. Signs are to be mounted at a 48 inches to 60 inches above the ground. Symbols for visual information is also a ADA requirement. 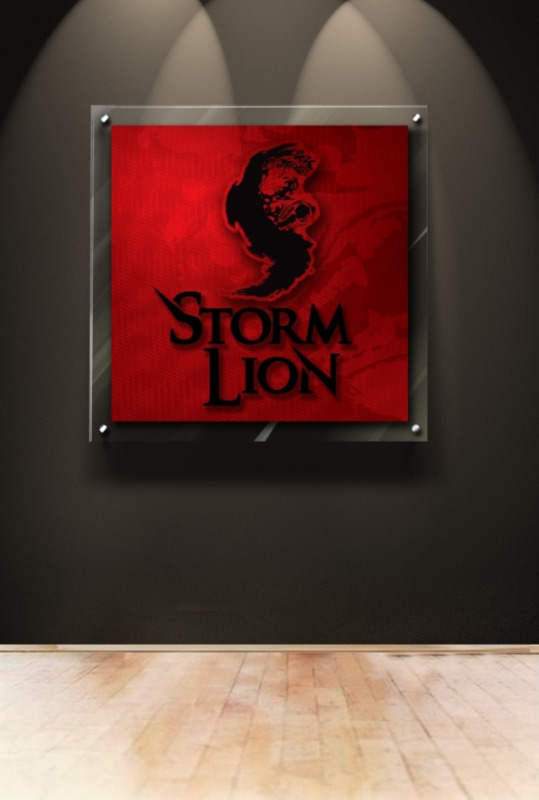 The symbol should be located within 6 inches of a vertical void and the background should not contain a non-glare finish. Braille and characters cannot occupy the same space as the pictograph. Color should contrast with the raised characters to make it legible for individuals with low vision. It is recommended that international symbols are used. For example the famous wheel chair accessibility symbol. Rest room signs must have a 1/2 inch foam tape. This is to separate the pictogram from the font and on a unisex to separate the male and female symbol. A reflective handicap sign for a parking space must be placed 60 inches above the ground, which is measured from the ground up. It is important to meet and be compliant with the ADA standard requirements. For more information please download parking lot handicap sign specifications. No matter your business or the property you own, if you have guests you are going to receive individuals with all sorts of different physical conditions. These different conditions might require some assistance in determining where to go and what entrances lead to wear. Simple, easy to follow signs are essential for your facility, as not only does it allow anyone who visits your store or place of business the ability to find their desired location, but it also ensures they can retain their self respect and not have to continually ask for assistance and instructions. Providing this small amount of assistance through appropriate signs can greatly improve your interaction with your clients and visitors, which makes them feel more comfortable with your building, in turn increasing the chances of them returning for repeat business with you and your company. ADA, or Americans with Disability Act, is a specific act pact inside the United States to ensure individuals with a disability are able to receive fair treatment and services throughout the country, regardless of the condition they are in. 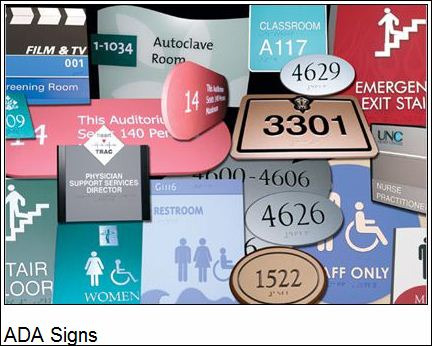 ADA signs are going to allow visitors to your facility, no matter what ailment they might have, navigate through your place of business and fine the necessary services they are seeking. This includes handicap parking signs, directional walkway and ramp signs, not to mention traditional bathroom and facility signs. All of these signs are designed not only to instruct anyone who visits your facility, but those with a disability, so they can freely and easily make it from the parking lot to the interior of the building, all without issue or other problems. It is important to let individuals know if a bathroom is handicap or not. Someone should not have to wait outside of the bathroom in order to find out if it is handicap accessible or not. With the handicap restroom signs, it is going to allow someone to simply walk up to the bathroom sign and know instantly if they are able to gain access to the restroom or not and if they need to continue looking for a different bathroom. These signs are simple and easy to put up and it does not draw any special attention to it. However, it does allow those with the need of a handicap bathroom the ability to identify such a bathroom and locate one that meets their specific needs. Braille is a requirement in many states now and it helps keep your facility compliant with these laws and regulations. It also helps those who have visual disabilities to ability to quickly and easily determine what the door leads to and what they will find on the other side. This way, by the simple addition of braille to the signs, someone can determine what kind of bathroom it is, the room number, what is located behind the door and where they might find a specific service. All of this is designed to help ensure the individual can remain confident in where they are traveling to and what they are looking for. Title 24 covers a large range of areas for your building, but you must comply to everything located inside of Title 24. This includes your signs, the information placed on the signs and how it is used. By receiving Title 24 compliant signs, you can rest assured that everything inside your building is up to code. Arial Black is one of the most common fonts to use on a banner. here, Arial is a little narrow to use for headline text. 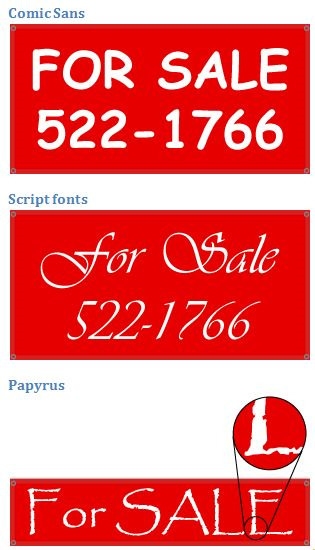 phrases on your banner, Arial is usually a little easier to read because of its clean appearance. only allows you to type in uppercase, so reserve it for short words or phrases. It has a tropical beachy feel that’s good for celebrations or sale banners. very strong, military feel to a banner and has all capital letters like Cancun. Some fonts look great on stationery, but they just don’t work for larger formats. Black letters on a yellow banner. This is your best option because it stands out better than a white banner, but the black letters still have high contrast on the yellow background, so they’re easy to read. Black letters on a white banner. You can jazz up this simple combination by using full color logos or graphics, or adding a colored border around the banner. Dark blue (navy) letters on a white banner. Once you start using colored letters, it’s better to stick to a white background, and the darker the letters are the easier they are to read. Dark green (forest) letters on a white or very light cream banner. Sometimes a cream colored background can help you match your company colors or just make the banner look a little more natural, but make sure to keep it light so that your words stand out against the colored banner. Red letters on a yellow banner. This is a popular color combination, but the reason it’s not a good choice for a banner is that red and yellow don’t provide much contrast. Red letters on a white banner would be a better choice because they will be easier to read. 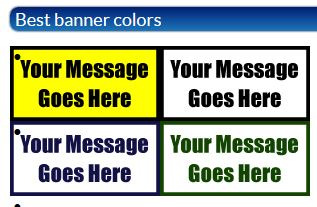 Or if you’re buying a full color banner, you could do part of the banner as red on white and part of it as yellow on black. It all depends on your preferences and your logo, if you are putting the logo on the banner. Red and green right next to each other. 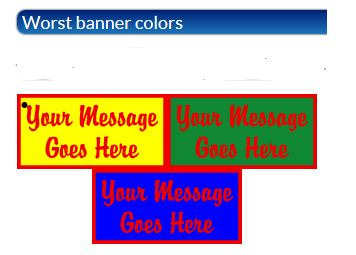 If you’re making a Christmas banner, you’ll want to use a white background and alternate red and green text. If you try to put red text on a green banner, or green text on a red banner, you’ll end up with a very hard to read banner. Red and blue right next to each other. Just like red and green, these colors shouldn’t touch. Separate them with some white space and you will make your banner much easier to read. Take some time to experiment with different color combinations, but try to stick to high contrast so that your banner will be easy to read. After all, the whole point of displaying a banner is for people to read it. For further information, please view our Visability Chart. Also available for download is our Guide To Color Choices.